The Gravity of Love is just my kind of book, moving back and forth in time, weaving together the various characters’ stories. Lewis was a young graphic designer having a passionate affair with Marnie in 1960s London. She was also a talented designer but he let her down badly and they parted acrimoniously. Years later, now married to Samantha and living in Arizona, mysterious postcards arrive from Ireland which he knows must be from her. Joy also lives in Arizona. She married Eddie when she became pregnant at 17. Two children later she is a housewife who has never had the chance to follow her own dreams. She feels like her family doesn’t know her especially when they tear up her beloved garden and replace it as a surprise. On his deathbed, her father revealed she was adopted but her mother won’t talk about it. All she knows is that her birth mother was Irish. With another revelation in her homelife, she feels even more rootless. The author has conveyed her settings wonderfully from the dry heat of the Arizona desert, to London in the swinging sixties, to the English home counties in the 1950s where Lewis and his sister Lizzie are passed from one relative to another which had a profound impact on their lives, and finally to a wet and stormy Ireland perhaps reflecting the inner turmoil of the characters. Is the rainbow a symbol of hope for Lewis and Joy? 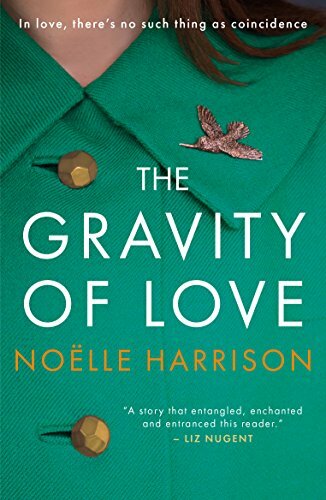 I really enjoyed The Gravity of Love and found it a very compelling read. It shows how issues from the past must be resolved to be able move on in the present. The ending was unexpected but uplifting and perfect. Reading The Country Girls by Edna O’Brien made me want to be a writer. I was always a big reader as a child, and loved to disappear into imaginary worlds, but this was the first book that felt so real to me. I was probably far too young to read it (thirteen) as it broke the silence on sexual repression in Ireland and was banned when it came out. I remember thinking I want to read more about the lives of women, their loves and losses. I still think it is such an important book, and Edna O’Brien is one of the most underrated Irish writers of our time. My other great literary icon is Isabel Allende for completely different reasons. Although I love reading her magically realist novels, it is her journey as a writer, which has inspired me most. Always it seems to me she has been true to herself. Working, raising a family, and writing at night while living in dangerous times in Chile before she fled to the States. When I feel like I don’t have enough time to write I remind myself of Isabel Allende and the circumstances in which she produced such sublime writing. To my great excitement, years later I got to meet Isabel Allende and she completely lived up to my expectations. Warm, generous and inspirational! I wrote my first novel Beatrice, while on maternity leave. Moreover, we had just moved from Dublin to rural Ireland. There was no public transport, and my partner had to drive to work in Dublin every day in our only car. He was gone from six in the morning until eight at night. I knew absolutely no one in the village. It was lonely. It was very lonely. So while my son was sleeping, I started to write Beatrice. The novel sprang from my isolation. The characters emerging from the bogs, woods, and drumlins of the Irish landscape. I hand wrote the whole book in a stack of notebooks. It taught me there is opportunity in every adverse situation. I have never claimed one place as my home. Ireland would be the closest to it as I identify as an Irish writer. But, I was born in London to an Irish mother, and grew up in an English village. I have lived in U.K., Ireland, Norway and now Scotland. There are many places where I have felt a sense of belonging from Venice to the Scottish Highlands to Hong Kong to Arizona. I am drawn to so many different landscapes. It is usually from a setting that stories for my novels emerge. I grew up living in other people’s houses as the daughter of a servant. Witnessing the private dramas of other families infused my development as a writer. My mother was slightly different from the average seventies Mum. Trained as a dancer and very independent. When she had my brother and I, she decided to bring us up in a country setting. So, with no experience at all, she applied for a job as a housekeeper through The Lady Magazine. She got the job and for the next twenty years, this was to be her life looking after other people’s families. We lived in beautiful houses en famille, or in our own lodge house in Berkshire, Buckinghamshire, Surrey and Oxfordshire. My mother taught me there is no need to own a property or even a car. You can live a good life if you are resourceful. She also taught me it is never too late as she met the love of her life when she was sixty! I began by writing plays, setting up the Aurora Theatre Company in Dublin in 1992. My first play, Northern Landscapes, was about child abuse, featuring music and projected images, alongside performance. It was before all the scandals came out in Ireland but I remember feeling that people were opening up to hearing these stories at long last. As a writer, you have to be resourceful in terms of making a living. I have done many different things from bookselling, to art curating, to waitressing, and cleaning. One of my most interesting professions was as a Tarot Card Reader. Something I have done since I was a child. It was through the tarot I met my husband as his sister came to me for a reading many years ago and afterwards introduced me to her family. So though, I don’t practice Tarot anymore, I always feel the cards brought me good fortune! Yoga is a huge part of my life. It helped me get through the loss of my mother, deal with daily anxieties and stresses, as well as provide me with a base from which I can write. To succeed as a writer you need focus and endurance both of which can be derived from the discipline of yoga. The character of Lewis in The Gravity of Love is inspired by my father, a graphic designer in London in the sixties. It was my imagining of his life, as I never knew him. However during the writing of the novel a miracle occurred. I found my lost sister and two other brothers. In so doing, I met my father for the first time. These events led me to rewrite the book. Moreover having being absent for most of life, my father was able to give me some advice on what it was like to be a graphic designer at the time the book is set. When I finished writing The Gravity of Love a cycle of rejection in my life had finally been resolved. Each of my novels are associated with talismans, objects symbolising the essence of the book beyond words. For The Gravity of Love, there are two symbols. A picture of a hummingbird with its small fierce beauty, and a large abalone shell, given to me by a friend, and which I can peruse literally for hours, its luminosity imbuing me with a sense of magical connections between nature and life. How simple and complex love can be at the same time. Which is after all what The Gravity of Love is all about.